Before I start my review proper there are a couple of things I wanted to mention. Firstly, Christine Blevins wrote an awesome blog post for us about Women at War. We are also giving away an 18th century style stationery pack to one lucky winner. (We are also currently giving away a copy of By the King's Design by Christine Trent so check that out too! Click on the links for more details). Secondly, the events in this book, take up pretty much where those of The Tory Widow left off, so please be aware there may be potential spoilers for The Tory Widow in the following review. 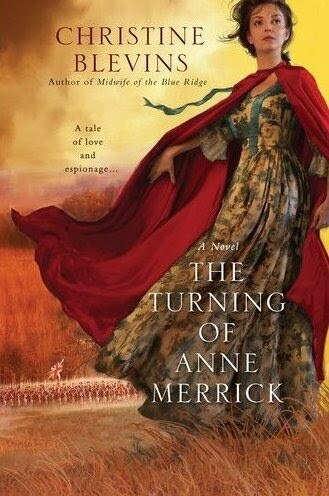 Anne Merrick has left the dangerous world of New York behind and now has joined her lover Jack Hampton on the road, but it isn't long before she is called upon to once again spy for the rebels by infiltrating the British camp, leaving the protection of Jack and Titus behind (Titus is the freed slave who initially worked with her husband but who had been her employee and friend ever since her husband's death) and once more having to rely on her own wits and guile to both provide the information that the Americans so desperately need about the British and to ensure that she isn't caught. She isn't completely alone though. As always, she is accompanied by her friend Sally, who also is in love with Anne's brother David, who is an officer in the American army, and along they way the tight knit group picks up a few more members that become important in their own right throughout the story. Anne's guise as a stationer and letter writer for the British soldiers, her willingness to work with injured soldiers, as well as her beauty and charm as a gentlewoman allow her to get close to officers who can then introduce her to the edges of the upper echelon of army society. She befriends the wives and mistresses of the various generals and so is able to glean information that is then transferred to the American generals and used to great benefit in their fight against the British. I do have to wonder if anyone in the British Army had ever heard the saying "Loose lips sink ships" because seriously there were lots of loose lips and that ship was definitely listing dangerously to one side! Whilst Anne is working as a spy at the British camp, Jack is once again at work as a scout, as a rifleman and as spy - anywhere he is needed really. The Jack in this book is much less of Jack the lad who was in the early pages of The Tory Widow, and is much more serious. I guess that some of the things he had done and seen have caused that change, and in my view was a realistic character development for Jack. He knows that Anne is working for the cause, just as much as he is, but that doesn't necessarily mean that he can bring himself to like some of the things that she has to do in the course of that role. Where the last book was really about bringing Anne and Jack together, in this book they are definitely a couple and so there is less of a romantic feeling. 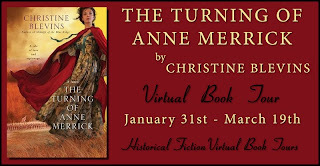 Once Anne leaves the British camp because it is getting too dangerous, she and Sally come into the American camp, where things are just as dire for the men there as they were on the other side. Blevins does a great job of showing just how bad camp life was - hunger, theft, disease and more were rife. I also thought that the author did a great job of showing the battles happening, without having them overwhelm the whole of the storyline. Given another risky assignment, Anne spends also spends time in Philadelphia. What Anne doesn't know is that the dangerous world of New York has not left her behind, and that there is someone from her past who would love to see nothing more than Anne Merrick swinging from the noose as a traitor. There were lots of names of real life historical figures mentioned throughout the narrative, and I have a feeling that if I was an American I would have recognised a lot more of them. For example, at one stage Benedict Arnold makes a cameo appearance and I sat there thinking that I knew that name. It took me ages to think of what exactly I recognised about it. One name that did have me sitting up and taking notice is when General Simon Fraser took the stage - I instantly thought of the Outlander books! Whilst I enjoyed this book a lot, there were a few episodes of info-dumping (how Jack makes his bullets, how to load a rifle etc) that weren't quite successfully integrated into the body of the story for my liking, and I never did quite work out how the armies were basically starving and yet Sally seemed to always have enough flour on hand to make scones. These are however small nit-pickings on my part and didn't affect my overall enjoyment of the book. Now that I have read both of these books I will have to wait patiently to find out what happens next in Anne and Jack's story. I am looking forward to it, even if it is a while away yet! I received a copy of this book from Netgalley in order to participate on this tour. 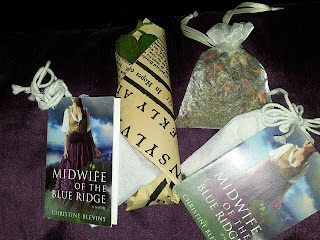 Special thanks also to Christine Blevins who sent a lovely package of goodies related to her books - Bohea tea, candles and soap. I will add the photo of it tomorrow morning. Sounds like a good read. 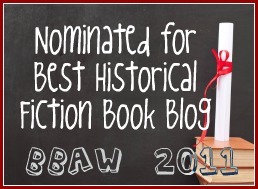 As someone who likes reading about women but isn't into "domestic" historicals, this sounds right up my alley. Too bad about the small glitches. It would be better if she were doing without food as well, but I think one can get past small inconsistencies like that.